Posted on October 19, 2016 by Richard Tagged Donald Trumppolitics	Comments1 Comment on How Can Anyone Still Be Supporting This Guy? How Can Anyone Still Be Supporting This Guy? It boggles the minds of some how Donald Trump still has support among the electorate. After all the things that have come out about him, from being beholden to foreign banks to the bragging about committing sexual assault, surely at this point his support should be in the single digits…. But there’s still a significant portion of America that still wants the least suitable major party candidate we’ve ever had to be President. Why? What are they thinking? What can their reasons possibly be? Let me try to put myself in their shoes. I’m not talking about the Deplorables – those who agree with his racist and xenophobic demagoguery. One hopes that their numbers really are an insignificant component of his supporters. There are also the die-hard Republican loyalists. These people would vote for a dead squirrel if it was a GOP candidate. There’s nothing that can be done to convince them to vote otherwise. Nor can anyone really do something about the rabid Clinton haters. They’ve been brainwashed by the “Right Wing Conspiracy Machine” and have totally fallen for the Anti-Clinton line. Nothing you can say to promote Clinton as even just a worthy candidate will change their minds. But that cannot account for all of Trump’s support. There’s got to be something more going on here. Let’s go back and look at the results of the 2012 election. 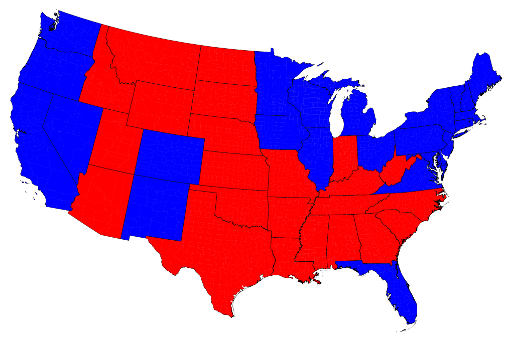 You’ve all seen those maps that color the states red or blue depending on whether they went Republican or Democrat, right? Aside from a couple of the usual liberal bastions like Vermont, what should be obvious is that the blue counties are where the major cities are, and the Big Red States are the least densely populated in the country. Densely populated urban areas vote Democratic; rural areas vote Republican. This “urban – rural” difference goes back to the founding of America, and still shows itself in the current presidential polling maps – which aren’t that different from the 2012 election results maps. One must then ask what is it about the rural areas that have made them so Republican in recent years. One of the key planks in Democratic platforms has been minority rights. These issues are obviously most important where there are a lot of minorities – and that means cities and urban areas. It’s a simple matter of concentration. If, say, that one in 10,000 people in the US are part of a specific minority, then in the large cities you’ll have hundreds of people in that minority. Their concerns will be noticeable and important. But in South Dakota, you might have a hundred of that minority in the entire state. No one’s going to notice them – or care about their problems. I like to joke that in the cities, “cultural diversity” means African-Americans, Hispanic-Americans, Asian- Americans, Muslim-Americans…. Out in the rural areas, diversity means Methodists, Presbyterians, Episcopalians, Lutherans….. While rural Americans no doubt care about their fellow man just as much as urban Americans, they don’t care much for a government program benefiting minorities simply because there aren’t enough minorities around them for it to be something they want their taxes spent on. That leads into another point. A lot of economic growth and development happens in cities first. That’s where it’s easiest to start a new business – there’s plenty of talent within reach, and there’s an infrastructure in place to help them grow. Out in the countryside, the federal government has had to bribe companies subsidize the spread of things we take for granted like electricity and phone service, because it wasn’t cost-effective for companies to do it on their own. 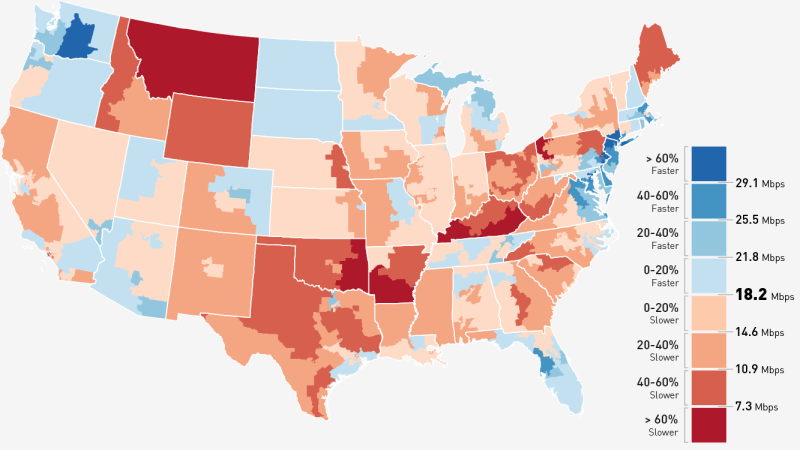 See how red the rural parts of the country are? The blueness of the Dakotas is due to the presence of the oil industry. They have high-speed access because they need it. But in places like Montana, there isn’t yet enough of a market for any provider to go in and build an advanced network on their own. People are too far apart anyway to make it worthwhile. So when red-staters hear about the Democrats promoting new business initiatives or infrastructure projects, they know it will be a long time before any of them see any benefits. Especially when they’ve heard it all before, and are still waiting. Maybe the Trump supporters aren’t all ignorant racists. Maybe some of them are just tired of hearing all the usual Democratic promises and prefer someone – anyone – who isn’t a Democrat. Maybe they’re not “pro-Trump” or “anti-Clinton” as much as they are against the political party that hasn’t even bothered to listen to their concerns in years….. I am one of those people (a profession making over 500K/year) that is just sick and tired of the same old politics. I had an ax to grind with Obama too, so , yes, I definitely prefer someone else. I don’t think Trump is all that bad, a typical crass business man from New York City. Look at Mayor Rudy Giuliani, almost comes from the same mold. And look at what he did in NYC, turned it completely around. Maybe Trump can do the same for this country? We shall see.